Throughout history, humans have looked for ways to manage mice and rats. The small, furry creatures can cause a host of problems by invading food stores, chewing building materials and spreading disease. 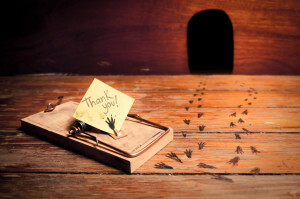 One classic mouse management tool is the spring-loaded mousetrap. A subject of both controversy and humor, the mousetrap consists of a flat wooden base and a wire spring mechanism triggered by a rodent’s weight. British inventor James Henry Atkinson created the “Little Nipper,” the prototype on which the modern spring-loaded mousetrap is based. Atkinson sold his patent to Proctor in 1913, and the company has been manufacturing the traps ever since. Not to be outdone by the Brits, American inventor John Mast received a patent for a similar snap-trap in 1903. His became the best-selling mousetrap of all time. Mast claimed that his design was safer; human users wouldn’t risk losing their fingers while loading the traps. For obvious reasons, it was a great selling point. Do We Have More Mousetraps than Mice? Some interesting variations of the classic design include the Victor Choker Mouse Trap manufactured in 1925; it contained four separate snap mechanisms. Made from bakelite and metal, Victor’s unique design seems to address the problem of multiple mice. You can find the four-hole Victor traps on eBay. A more recent addition is the mouth mousetrap. It consists of a set of plastic jaws with a coiled spring and a trigger located inside the jaws with the bait. When a mouse reaches for the bait, the jaws snap shut. Mouth traps seem to be designed for those with an extreme fear of pain. They can be armed by foot alone. We still haven’t stopped trying to build a better mousetrap; the Patent Office grants approximately 40 patents for mousetraps each year, and it receives 10 times as many requests. If mice decide to make your home theirs, a couple of mousetraps probably won’t do the trick. When San Antonio homeowners find mice, they trust the rodent control specialists with a history of success in managing the city’s abundant mouse and rat populations. At ABC, our trained technicians will develop an intensive trapping schedule to remove your furry pests, and then they’ll locate and seal all possible points of entry to keep them away. We can quickly identify signs of rodent invasion and conditions that are conducive to infestation. Don’t risk your health or your home’s integrity; contact us today to schedule service.